This post really should have been named Surprisingly Easy Bureaucracy. K & I gave up our place in Colorado, and moved to Texas. I’m not going to go into the whys here, if you are curious mail me. I was *extremely* surprised at how easy the whole process was. I spent a long time being worried something would go wrong and it “wouldn’t work”. Every other time we’ve moved the process just seemed to drag on and on with extremely long wait times. In reality there was… a lot less to worry about than I expected. Since we were going to be on the road a lot, we choose a service (Escapees RV Club) to handle our mail. We drove to their office at Livingston, TX, showed up at ~9:30 on a Monday morning. The ladies at the office were super helpful. They gave us a brochure that included where to go for vehicle registration and testing, and also where the drivers license office is and what we needed to do and show at each office, complete with checklists. We then called (only Verizon works at the office) to get our car insurance switched over, got that printed at the Escapees office, then got our car tested ($7.50), and car registered in about an hour. Afterwards we drove 5 minutes to the DMV to get drivers licenses which had a wait time of ~45 mins. They asked for the paperwork we were told we would need (vehicle registration and proof of insurance) for proof of address, the usual passport and SSN stuff. Then… we took an eye exam and we were done before 1pm. Our drivers licenses and voter registration appeared in 2 weeks, and that was it! We spent the time exploring Austin, Houston, and New Orleans. There is some really good food down in the South. Amazing BBQ, tacos, yummy yummy boudin, kolaches, and fun escape rooms too! 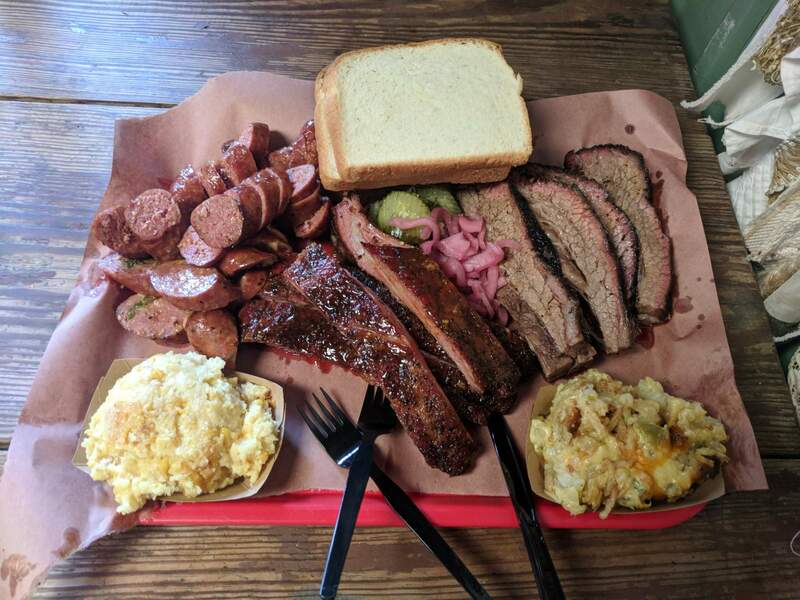 Truth BBQ from near Houston. This was so delicious, and it took us 4 meals to finish all this meat.